How safe are extended wear contact lenses? Find out the risks of wearing overnight contacts. Some people have jobs or a lifestyle that makes wearing normal soft or RGP lenses very difficult if not impossible. Working on an oil rig, for instance, means your hands are always filthy so cleaning lenses isn't exactly easy and even daily disposable contacts will get covered in grease. But in the past, extended wear contact lenses were deemed to be risky as eye infections, especially pink eye, often occurred after wearing contacts for 7 or more days at a time. As these overnight lenses were then re-used after the 30 day period, the problems continued and as a result, for a time, the FDA banned all overnight wear contact lenses. The latest silicon hydrogel technology has meant that some lenses can now be safely worn as 30 day contacts, provided your optician agrees that your eyes are suitable. 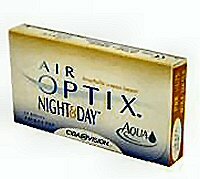 One such lens is AIR OPTIX Night &Day Aqua, the first silicone hydrogel soft contact lens approved by the FDA that can be worn 24 hours a day for up to 30 days and nights, even while you sleep. Wear them for up to a month, then throw them away and get another pair of 30 day contacts. The makers Ciba Vision claim that they allow six times more oxygen through the lens than traditional soft lenses, which is why the FDA approve them for long term overnight use. So if you're ultra lazy, going camping or have a busy lifestyle where you don't sleep much or don't have time to take lenses in and out, then these sleep in contacts could be for you. Just be sure to check with your optician before using extended wear contact lenses. There is another type of lens designed to be used as overnight wear contact lenses, known as an Ortho-K lens. It's basically a rigid gas permeable lens, designed to be worn overnight to actually correct your vision and in doing so, can avoid more expensive and certainly scary LASIK eye surgery. It sounds crazy, but the RGP lens gently reshapes the cornea of your eye while you sleep, allowing you to see clearly WITHOUT eye glasses or contact lenses during the day. NB: Ortho-k lenses are NOT extended wear contact lenses, just contacts that are worn overnight to correct your vision so you eventually won't need to wear glasses or contact lenses again. Powered by Site Build It! | Copyright © 2010 - 2018 www.comfortable-contact-lens-secrets.com; All rights reserved.